Spinningfields is a new commercial, retail, and residential development in central Manchester. It occupies a 22 acre site in central Manchester, bounded by Deansgate, Quay Street, Bridge Street, and the River Irwell. With many modern office buildings the development has been dubbed Manchester’s Canary Wharf. Businesses based here include the Grant Thornton, HSBC, Deloitte, Barclays, BNY Mellon, and the General Medical Council. 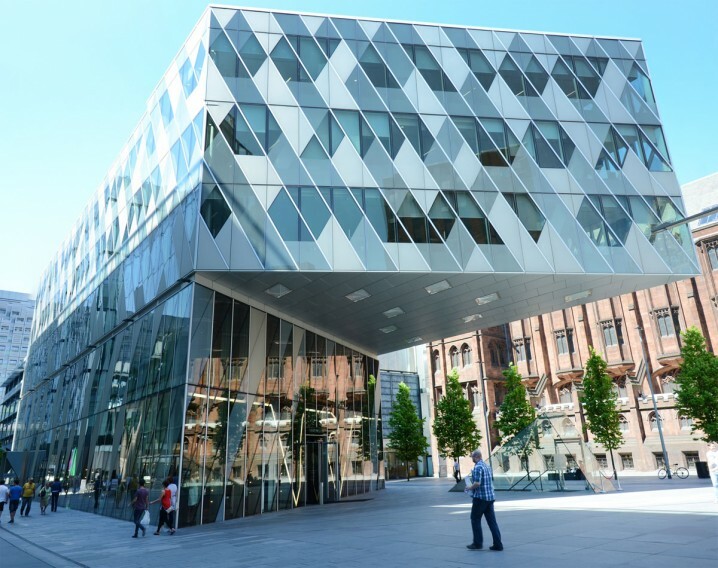 The Manchester Civil Justice Centre is also here and is one of the most striking buildings in the city. It is noted for its 11,000 square metre hung glass wall, the largest in Europe, and the cantilevered court rooms that project from the building. The Leftbank is a mainly residential area located to the west of the development. It features almost 400 luxury apartments and penthouses and overlooks the River Irwell. The Avenue is a high-end shopping destination with an impressive list of tenants including Armani, All Saints, Kurt Geiger, and DKNY. Restaurants and bars at Spinningfields include Café Rouge, Carluccio’s, Giraffe, Gourmet Burger Kitchen, Nando’s, Samsi, Wagamama, and Zizzi. Attractions here include the People’s History Museum, John Rylands Library, and the Manchester Opera House. The closest Metrolink stations to Spinningfields are St Peter’s Square and Deansgate-Castlefield. The nearest car park is the NCP multi-storey car park on New Quay Street. Satellite navigation owners can use the postcode M3 3BE to find it.